There is a lot of reading material out there on the Tudor dynasty. I think every year some or the other book gets published and perhaps rightly so – given the scope and grandeur of this family. No other history has captured my interest the way the Tudor regime has and that is why I keep going back to it, time and again. 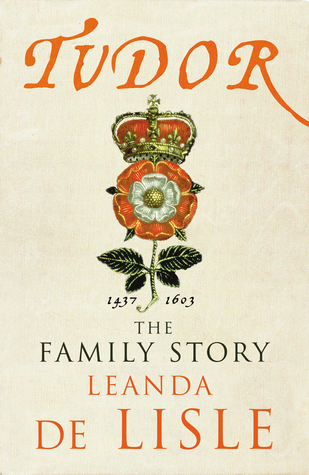 Tudor: The Family Story by Leanda de Lisle however was a different read for me. Leanda de Lisle talks of things not mentioned that often. She takes on characters that were a part of history and forgotten – a man who fell in the Queen’s bed and what happened to Henry VII. The book takes into parts that are normally not spoken of. After all, every family has its own secrets and Leanda just talks of those and the past in this book. The writing is fact driven and yet reads like a fictional account, which works splendidly for the reader. The book opens before the War of the Roses and ends with the death of the Tudor dynasty (Elizabeth I to James I). The book can get confusing at most times, however it is up to the reader to watch out for the family trees and charts and keep track of events and people. I am a keen follower of the Tudor dynasty. I love reading everything about that time and era. This book is heavily researched and yet so readable. It succeeds in portraying kings and queens as people and also making the reader see the lives they had. “Tudor: The Family History” is one non-fiction read which perhaps I could reread later. Though the book is a big read, it is extremely satisfying and interesting. A book not to be missed for hard-core lovers of history. This entry was posted in Books, British History, Chatto and Windus, Non Fiction, Random House UK, Review, The Tudors and tagged Chatto and Windus, Elizabeth I, Henry VII, Henry VIII, Leanda de Lisle, Non-fiction, Random House UK, the tudors on December 6, 2013 by thehungryreader.